Friday morning at about 6 am, after a stormy day and night, the sea ice broke off once more. It had been safe to travel on for about 3 weeks by then, with increasing traffic of dogsled and snowmobiles. Ingkasi, an early riser, had seen the ice break off and woke me up immediately to move our dogs. They were`n directly in danger, but standing very close to shore, possibly at risk to get showered in saltwater in case of big waves coming in. 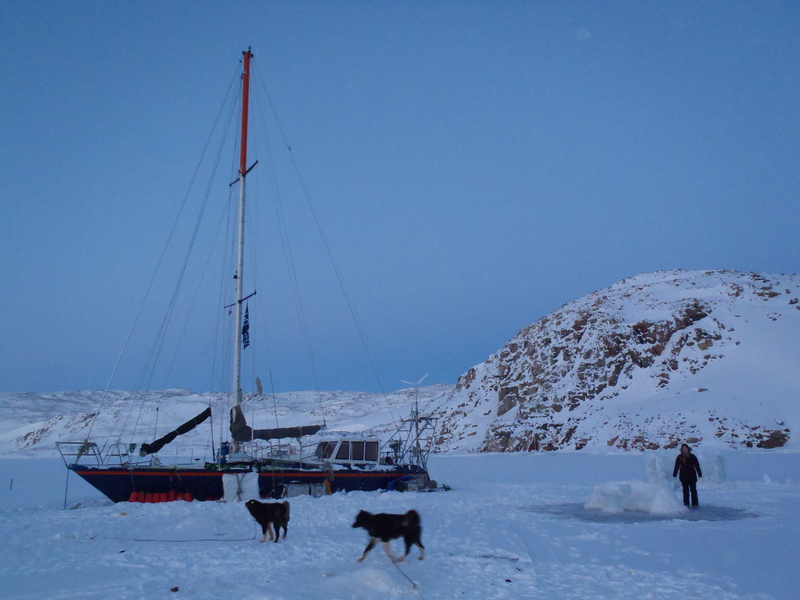 While we worked on the dog chain, it was still windy, with slush – it actually felt more like rain – blowing in out faces. Coming home, our jackets and pants were completely wet. The weather hasn`t changed much since then, and I`ve gotten used to wear a rain-jacket. Ingkasi sais he can`t remember there`s ever been open water in Ittoqqortoormiit at Christmas. It just doesn`t fell right. These pictures were taken a few weeks ago, before heavy snowfalls and storms set in. I went for a walk into Andrup Havn, to together with a friend, to visit our new neighbours on board of the “Argelvor” (more about them and their project at www.argelvor.com). After several cups of delicious coffee and a good chat we walked back to Ittoqqortoormiit, enjoying the crispy air and beautiful coloured sky. December started with the usual celebration of the First Sunday in Advent. 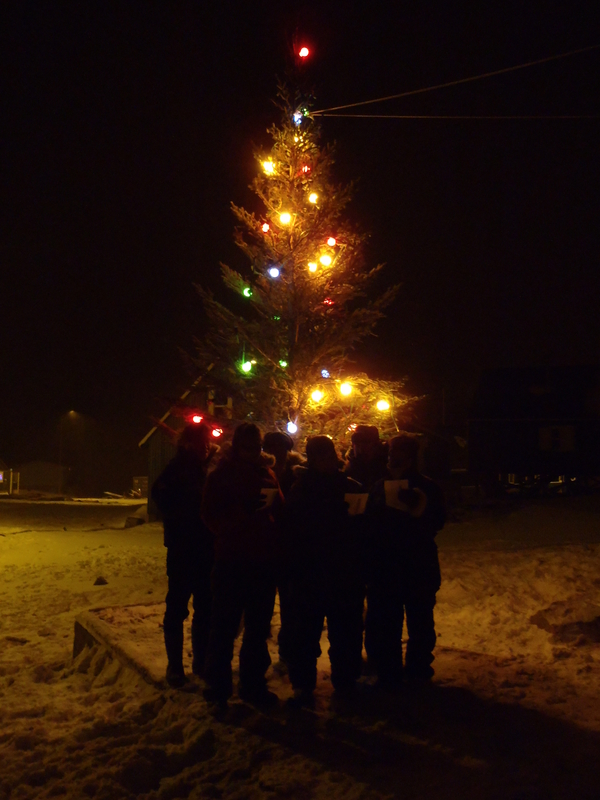 In the afternoon the lightening of Ittoqqortoormiits outdoor Christmas tree was taking place. What impresses me is that the tree is still standing! It has survived all the blizzards we`ve had this month – so far! 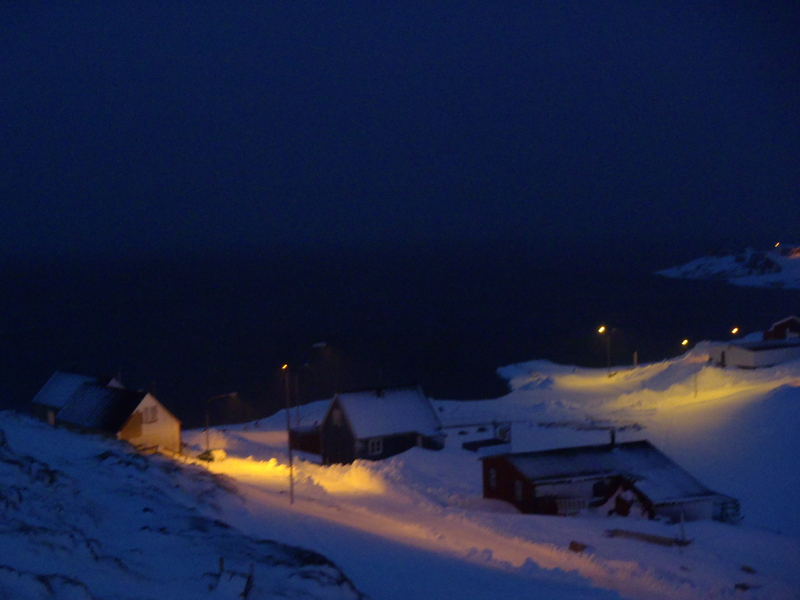 After a cute 4-year old girl got to switch on the light of the tree, the choir sang a Greenlandic Christmas hymn. When it comes to indoor activities, I´ve been knitting Christmas gifts of some of the musk-ox yarn I`d spun earlier this year. 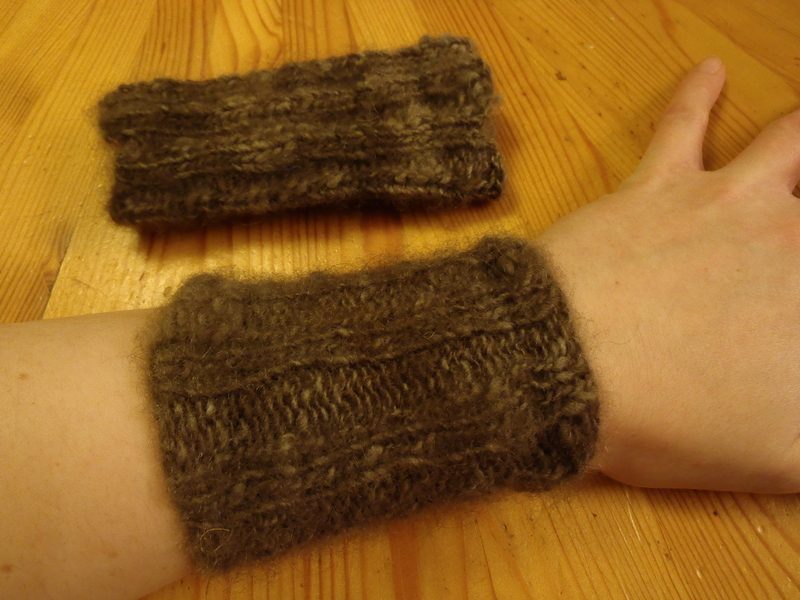 It`s fun to think about that I `ve seen the musk-ox who was carrying this wool walking around all alive, then dead, that I`ve eaten some of it`s meat and finally processed its wool all the way into a pair of wrist warmers. One of you will find these under the Christmas tree very soon 🙂 . 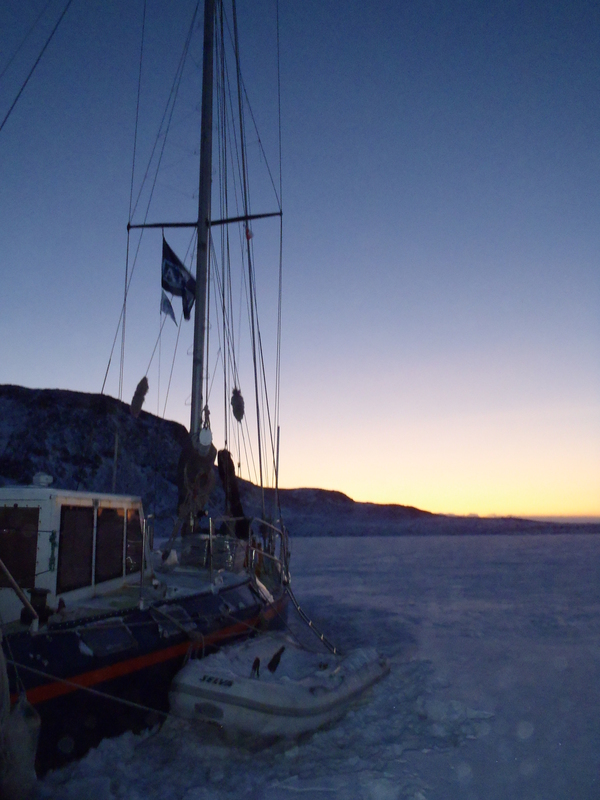 During the first weeks of december, as soon as the new ice was safe, Ingkasi went seal-hunting at the ice edge. 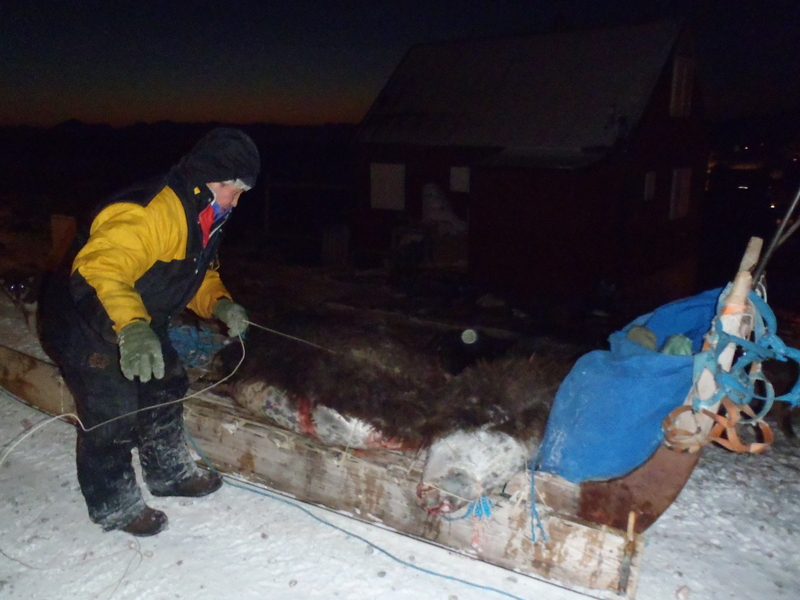 At december 12th he shot 2 musk-ox close to the Kalkdal cabin in Hurry Inlet. These two pictures were taken on a day he came back from the ice-edge with several seals on his sledge. From now on, the hunters will have to go out by boat until the sea freezes up once again. 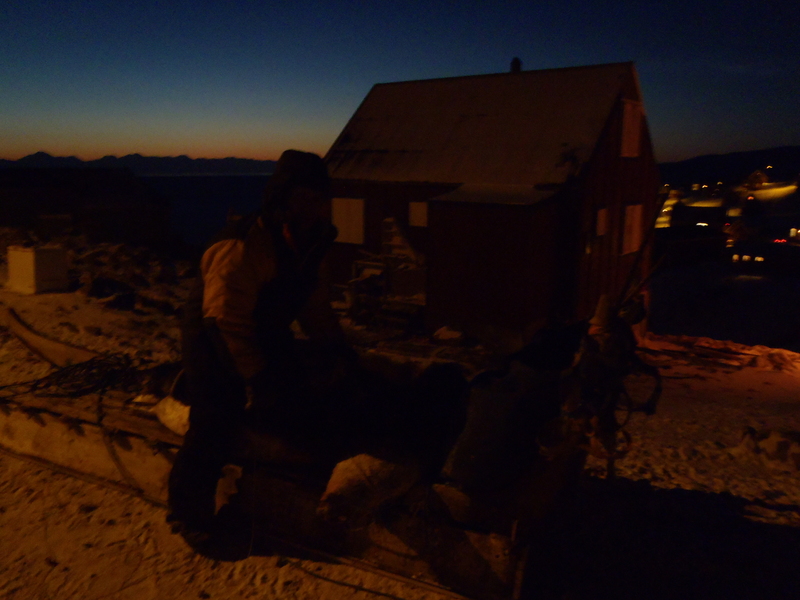 Since we don`t have a working engine for our boat right now, and because it is better to hunt by dog-sledge at this part of the year, we hope it`ll freeze up again VERY SOON!! 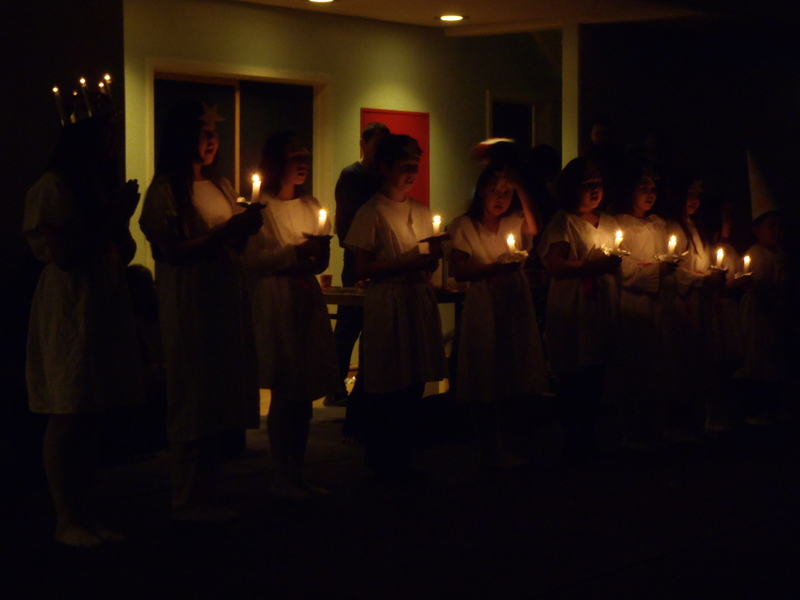 At december 13th, several hundred people gathered at the sports hall to celebrate “Santa Lucia”. There were different kind of activities going on. Both the kindergarten and the school had their own Santa Lucia performances, and the kids did very well! 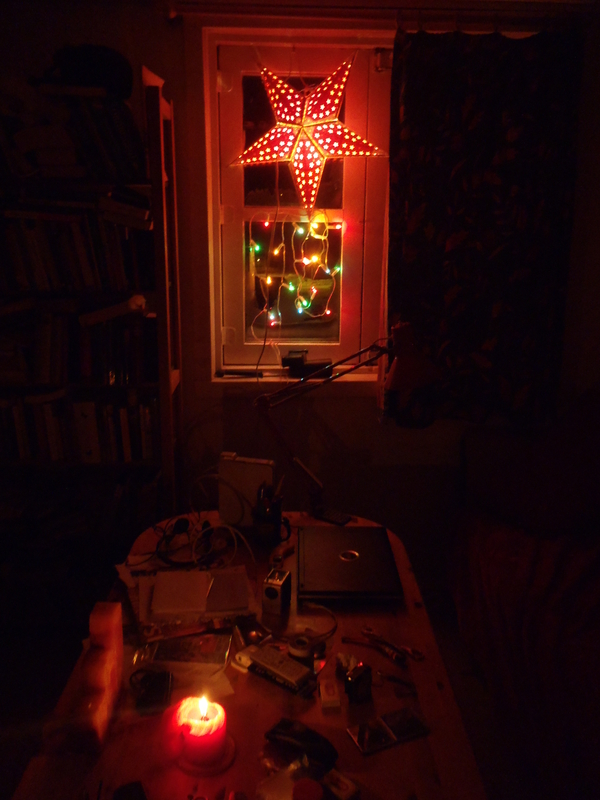 … enjoying the light of the “Star of Bethlehem” hanging at the window, that`s so characteristic for Christmas in Greenland, and that reminds me of what it really is we are celebrating, just now. I wish you all a joyful and blessed Christmastime and a happy New Year! Kære Ruth og Ingkasi ! Dejlig og foruroligende læsning om isen. Ingen tvivl om opvarmningen. Det har store konsekvenser! Det er dejligt at følge lidt med i livet i Ittoqq. I ønskes en glædelig jul og et godt og lykkebringende nytår. Vi er klar til den store aften i aften. Ingrid og hedes 4 årlige datter Maja, har pyntet juletræet og det er så flot. Her er grønt og ikke engang tæt påfrysepunktet. Jeg elsker sne, men den ser ikke til at være lige om hjørnet. Godt at høre fra dig, Ulla! And may I ask your permission to reblog this on my own website?